From the outside, the Telecentro Comuntario de Assomada does not look like an Internet café. It is a nondescript ochre colored building that looks like it could be a storage shed or somebody’s house. Paper posters advertising the telecentre keep on getting blown away in the steady wind so the staff is thinking about a more permanent neon sign. The telecentre is located in the town of Santa Catarina, the second largest on the island of Sao Tiago, Cape Verde with a population of 42’000. 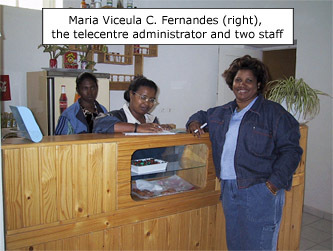 A US$ 50’000 project of the International Telecommunication Union (ITU, www.itu.int) and Cabo Verde Telecom (CVT, www.nave.cv), the incumbent telephone company, the telecentre opened in May 2001. CVT is providing 50 per cent discount on telecommunication and Internet access during the first year. The telecentre has a 64 kbps ISDN connection to the Internet. Members of the some 3’000 strong Women’s Association of Santa Catarina, operate the telecentre. Two people staff it during working hours, 8 am – 10 pm daily except Sundays. The only male involved in the operations is the guard. Services available include recharge of mobile prepaid cards, purchase of telephone calling cards, public phone calls, Internet access, PC applications, photocopying, printing, and fax. Drinks and light snacks are also available. The price of Internet access is 150 Cape Verde Escudos per hour (US$ 1.25), less expensive than at the other two Internet cafes in town. Clients of the five PC telecentre include students and professors from a nearby school as well as residents of the local community. There are around 60 users per day each using it on average of half hour. There is an extra table for people to wait, as the telecentre tends to get crowded during peak times. PC and Internet access training for women is in the pipeline. There is also a plan to introduce an e-commerce component to sell handicrafts made by local women. This would include digitizing the products and displaying them on a web site. 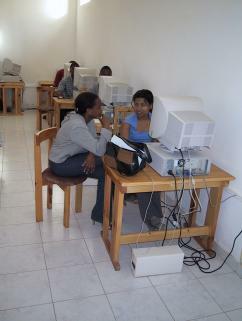 See the Cape Verde Internet study.